Older artists who struggle futilely for recognition often envy those who achieve great success at an early age. But never being able to surpass or even equal a youthful triumph can be a cruel fate for those who believe you are only as good as your latest work. This is the potentially daunting reality that Maya Lin has lived with for three and a half decades, since she skyrocketed to fame at the age of twenty-one, when during her senior year as a Yale undergraduate architecture major she won the open design competition that resulted in the most influential public monument created since World War II: the National Vietnam Veterans Memorial of 1981–1982 in Washington, D.C. Although Lin’s rigorously abstract scheme—devoid of the representational elements and allegorical imagery typical of war monuments since ancient times—provoked great controversy in some quarters when it was chosen from among the 1,421 contest entries, her powerful melding of the period’s two main avant-garde sculptural developments, Minimalism and Earth Art, fundamentally recast popular notions of commemorative architecture. This symmetrical composition of two wedge-shaped, vertically paneled, polished black granite walls set at a 125-degree angle to each other and sunk ten feet below grade at their deepest is inscribed with the names of 58,307 American military personnel who died as a result of the Vietnam War between 1957 and 1975. The sloping walkway parallel to this 493-foot-long expanse of stone begins at street level and then reaches its nadir at the monument’s midpoint. The transit along the declivity gives one the palpable impression of being swamped by a tide of mortality as the rows of names rise higher and higher above one’s head. Then, as the pedestrian path begins to ascend at the structure’s midpoint, the opposite occurs, the sensation ebbing and abating as one reaches the flat expanse of the Mall once again, filled with relief that the flood of names has finally ended. It is not uncommon to see visitors in tears or even sobbing after they have negotiated this symbolic abyss, a journey made all the more unnerving because of the unconsoling directness of the experience. 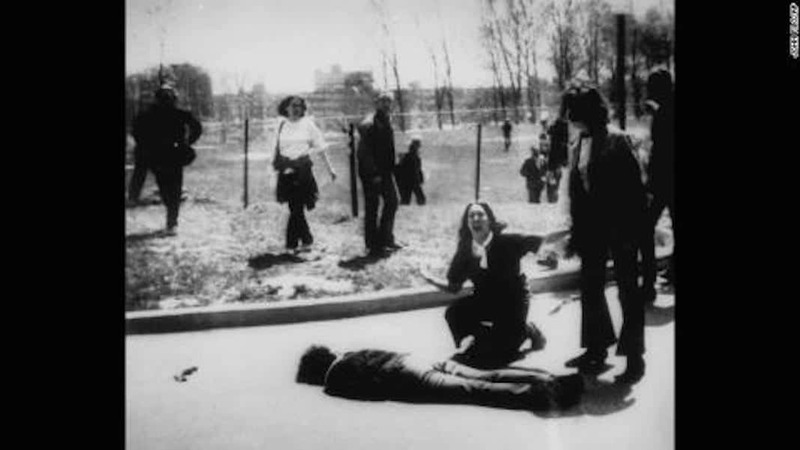 The adage that success has many fathers but failure is an orphan certainly pertains to those involved with the Vietnam Veterans Memorial commission, although the person most responsible for its triumphant outcome—the artist herself—has never tried to arrogate sole credit for what became a hugely complicated and highly politicized process. Robert Doubek, who served as executive director of the Vietnam Veterans Memorial Fund—the nonprofit organization created in 1979 to raise money for the monument’s construction—has written a heartfelt memoir of the struggle to bring this patriotic dream to fruition, and he is not at all reticent in aggrandizing the part he played. 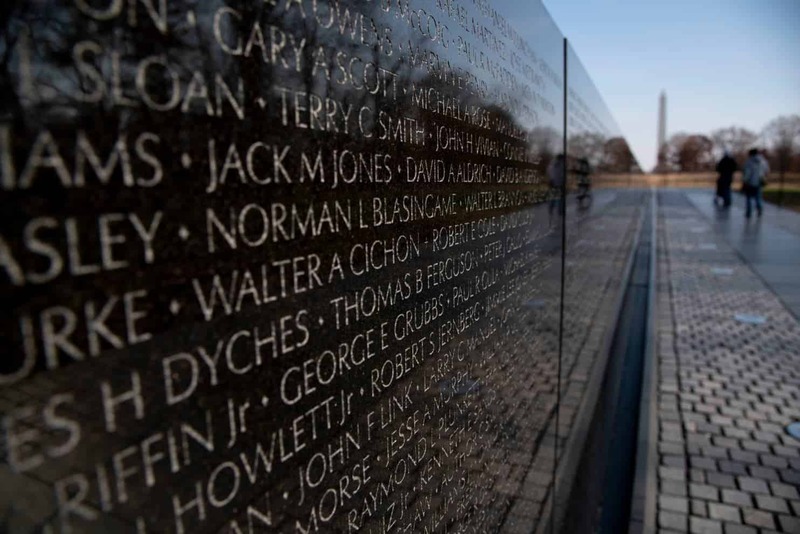 As the definite article in his subtitle suggests, Creating the Vietnam Veterans Memorial: The Inside Story is not only a first-person but also a one-sided account of this frequently contentious saga. Nonetheless, for all its flaws and self-serving paybacks, this is a valuable contribution to the memorial’s historiography, above all in Doubek’s portrayal of conflicting forces vying for supremacy. We get a vivid sense of the emotions Lin’s design aroused among those who felt her scheme was disrespectful to the memory of the fallen because of its uncompromising abstraction and the way it is dug into the earth—a grave, a pit, a latrine, detractors charged—rather than elevated to a position of high honor. Concerted objections to Lin’s design among veterans’ groups led to the addition of a naturalistic bronze statue, Frederick Hart’s The Three Soldiers, which depicts a trio of zombielike combatants who exhibit the so-called thousand-yard stare of battle-hardened warriors. Unveiled a year after the main memorial’s completion, this kitschy tableau was at least placed far enough away from the great earthwork to inflict minimum damage. Not surprisingly, Hart’s hypermasculine lineup spurred feminists in turn to demand yet another sculptural supplement to the site, which resulted in the Vietnam Women’s Memorial (1993), a bronze figural group by Glenna Goodacre that shows three servicewomen tending to a wounded GI in the attitudes of an overcrowded but still male-centered Pietà. attracted a respectful crowd but not an awed or silenced one…. One young man wearing fatigues and smoking a cigarette was…draped over the figures: respect was not evident. The sculpture, composed of so much posturing, seemed to prompt some more in its visitors. The guidelines for the competition…insisted that the memorial make no political statement about the war. 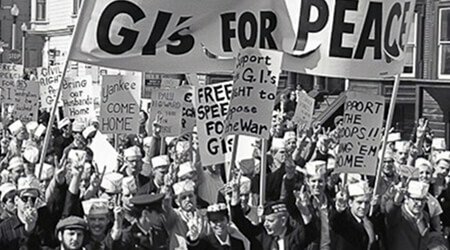 It might be argued that refusing to discuss the war was tantamount to a negative statement about it and that silence itself could be considered a distinct form of rhetoric. Although responsibility for the creation of meaning at a memorial (or any work of art) ultimately rests with the viewer, the rhetorical effect of silence is heightened at the VVM by its reflective surface. As one confronts the names, essentially staring both separation and mortality in the face, interpretation inevitably becomes personal and—given the nature of this war—political…. Visitors behave reverentially, as if they were at a cemetery, largely because the presence of bodies is implied by the list of names on the Wall…. 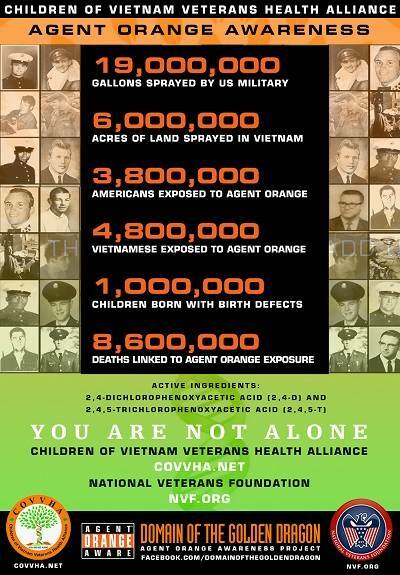 Even though most of the Vietnam dead are buried in local cemeteries around the country, interment is implied by the way the memorial is placed into the ground. There are many good things in Memorials to Shattered Myths—especially Senie’s insightful interpretation of the modern phenomenon of spontaneous vernacular memorials, which arise on the site of tragic incidents ranging from fatal traffic crashes to random shootings and are quickly festooned with flowers, balloons, candles, stuffed animals, and handwritten tributes. However, her reading of the Vietnam Veterans Memorial strikes me as mistaken, most of all her assertion that the design is somehow evasive about the true nature of the war and inevitably mistaken for an actual burial ground. I find the opposite to be the case. The pervasive influence of Lin’s masterwork has been repeatedly demonstrated in a period when traditional forms of architecture and sculpture seem wholly inadequate in memorializing events once deemed unimaginable, most clearly the attack on the World Trade Center in 2001. Michael Arad and Peter Walker’s National September 11 Memorial of 2003–2011 on the site of that catastrophe reinterprets several of Lin’s concepts in highly original ways. She turned instead to environmental sculptures, as well as to a smaller number of modestly scaled buildings that have led some to underestimate her degree of professional ambition. Yet in contrast to architecture as many males in the profession still would define it—the bigger, costlier, and showier the better—her meditative view of the building art provides a means for expressing poetic impulses about humanity’s place in the natural, rather than man-made, environment. Indeed, Lin’s steadfast determination to ignore the corruptions of modern publicity—that fatal addiction of postmillennial culture, signified in her profession by the hideous neologism “starchitect”—is among her most important qualities. 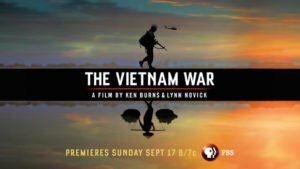 Maya Lin’s more distant antecedents were no less distinguished, as was revealed in a recent episode of the PBS series Finding Your Roots, with Henry Louis Gates Jr., in which the Harvard historian showed her a copy of a scroll that purportedly traces the Lin family’s origins directly back to her ninety-ninth great-grandfather in 1092 BCE. Gates also identified one of her maternal great-grandmothers, Ye Deyi (born 1885), a gynecologist and pediatrician who was among China’s first female physicians. 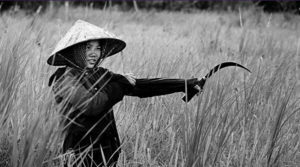 Lin’s self-assurance in entering a field still dominated by men doubtless owes much to her parents’ encouragement, but it is hard not to wonder if genetics had a part. 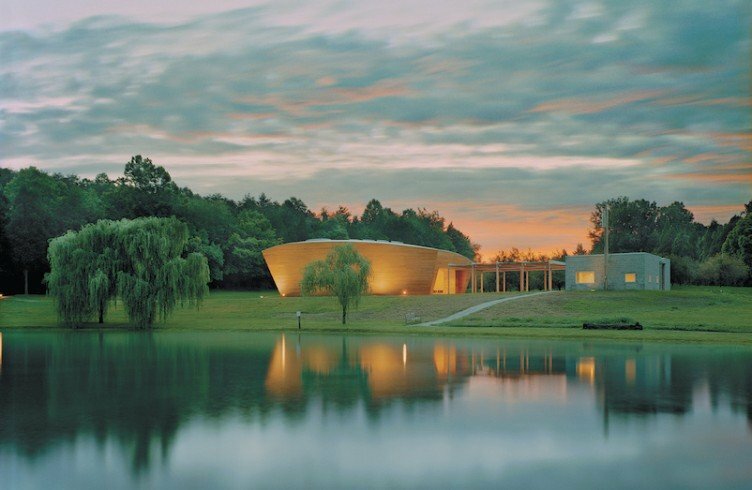 Her gift for the sympathetic placement of architecture within a landscape is of a piece with her strong sculptural instincts, and most evident in her work at Haley Farm, the rural campus of the Children’s Defense Fund in northeastern Tennessee. Her two buildings there, though quite different from each other, are alike in their sensitive siting, humane scale, humble materials, and appropriateness to their function. They symbolically evoke the enclave’s purpose as a training and conference center for young community activists of color. Her first project on the 157-acre site—the Langston Hughes Library of 1999—was a remodeling of an 1860s barn of a form particular to the region: a rectangular shed raised one story above the ground, atop a considerably smaller pair of grain-storage cribs composed of horizontally stacked logs. She treated the existing building as a precious historic artifact, but to support the significant added weight of heavily laden bookshelves inserted an entirely new steel framework within the wood-frame structure. Lin employed an equally timeless form for the nearby Riggio-Lynch Chapel of 2004, a simple but beautifully crafted wooden structure whose subtly curving contours recall those of a boat, a reference that harks back to early Christian iconography of the church as a barque akin to that of Jesus and his apostles as they fished on the Sea of Galilee. Indeed, the architectural term “nave”—the main enclosure of a sanctuary—stems from the Latin navis (ship). An extra layer of symbolism attaches to this seemingly beached vessel on the edge of a pond fringed by weeping willows. The finely crafted but economical unpainted particleboard interior of the windowless chapel is illuminated by skylights, and one’s focus is directed to the central pulpit in the grand tradition of black preaching churches. 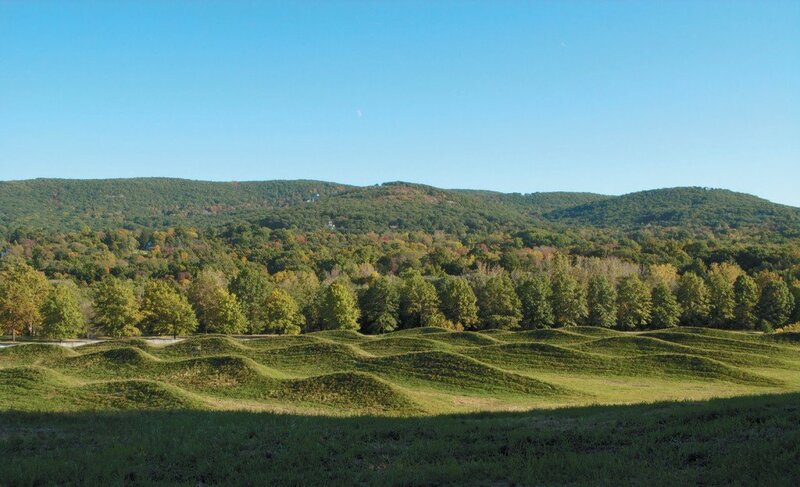 Lin has demonstrated a similar topographic awareness in her remarkable series of earthwork sculptures, which began with The Wave Field (1995). It was commissioned for the interior courtyard of an aerospace building at the University of Michigan in Ann Arbor, named in memory of an alumnus, François-Xavier Bagnoud, a helicopter rescue pilot who died in an air accident at age twenty-four. Eager to express the freedom and fluidity of youth and aeronautics, Lin found inspiration in the undulating, parallel lines of a water current called a Stokes wave. Using that pattern as a model, she demarcated a hundred-foot square, had its surface shaped on the diagonal into rows of swelling grass-covered hillocks three to five feet high, and achieved an effect of rippling propulsion akin to a verdant meadow beneath the rotors of a chopper during lift-off. At once specific in its commemorative purpose but generalized in its abstract, hypnotic beauty, The Wave Field, now a popular campus gathering place, demonstrates Lin’s genius for transforming profound personal loss into a force for social cohesion, no less so than in her most famous work. Lin has since produced two variations on this theme:Flutter (2005), for a federal courthouse in Miami, Florida; and the eleven-acre Storm King Wavefield (2009) at the eponymous sculpture park in Orange County, New York. The latter installation is more extensive than its predecessors not only in area, but also in the size of the waves, which here vary from ten to eighteen feet high, with a separation of some forty feet between each row of mounds, proportions that approximate the sensation of being on a stormy sea where one’s view of the horizon is blocked by tall swells. Storm King Wavefield gives those who climb up and down the slopes to reach its centermost folds a palpable sense of being engulfed by the forces of nature, an immersive experience not unlike that of Lin’s Washington memorial, but without the political meaning imputed to that earlier work. Related to the wave fields but more reminiscent of the land forms built over a five-thousand-year period by Native American cultures collectively known as the Mound Builders are Lin’s “Earth Drawings.” These include Eleven Minute Line (2004) in Sweden and Kentucky Line (2008) near Louisville, both of which extend like gigantic snakes across their rural settings. These works are less pictographic than their ancient antecedents, which often represented living creatures; their most obvious model is the Great Serpent Mound in what is now southwestern Ohio, which has been dated to the eleventh century but may be much older. Like many such constructions (unless they are cut into a hillside) their patterns are most discernible from overhead, and thus Lin’s “Earth Drawings” are not as fully comprehensible at ground level as her wave fields, which exert a far stronger effect on the viewer. Since 2008, Lin has been represented by the New York–based Pace Gallery, one of the four so-called megadealers (along with Gagosian, Hauser & Wirth, and David Zwirner) that have increasingly monopolized the very high end of the international art trade. Other earthwork artists have their own galleries, even though one of the motivating factors behind Earth Art was to create works whose environmental, site-specific nature would negate the commercial commodification that disturbed many young artists during the late 1960s. However, in order to finance such costly undertakings as Michael Heizer’s massive earthworks or Christo and Jean-Claude’s grandiose wrappings, these visionaries also created salable objects to underwrite their endeavors. Lin’s Around the World x 3 (2014) is a twelve-foot-wide floor piece comprising three concentric rings of white marble, an arrangement that immediately suggests Richard Long’s circular aggregations of rough-hewn stones on a flat surface. The upper surfaces of Lin’s tripartite, target-like composition are naturalistically carved at various heights to suggest comparative elevations of points around the globe including the North Pole, Iceland, the Ural Mountains, the Bering Strait, New York City, Ecuador, Indonesia, Kenya, and the Democratic Republic of Congo. Given several other recent conceptual pieces by Lin that address the crisis of climate change, rising sea levels, and the effect that global warming is having on the world’s coastlines, one assumes that the aim of this beautiful object is to dramatize that imminent threat in readily comprehensible form, although such a theme is not fully enough specified in Maya Lin: Topologies, the handsome but occasionally sketchy new monograph that supersedes her earlier compendium Boundaries (2000) as the complete record of her output. However, without a clearly expressed account of her aims (which may have been provided when these works were shown by Pace and in museums in the US and Europe), one cannot be quite sure. What is certain is that the elegant surface Lin achieves here—which attains a level of suave semiprimitive effect reminiscent of Isamu Noguchi’s half-raw, half-polished stone sculptures—can also divert attention away from the urgency of her important if inchoately articulated message. 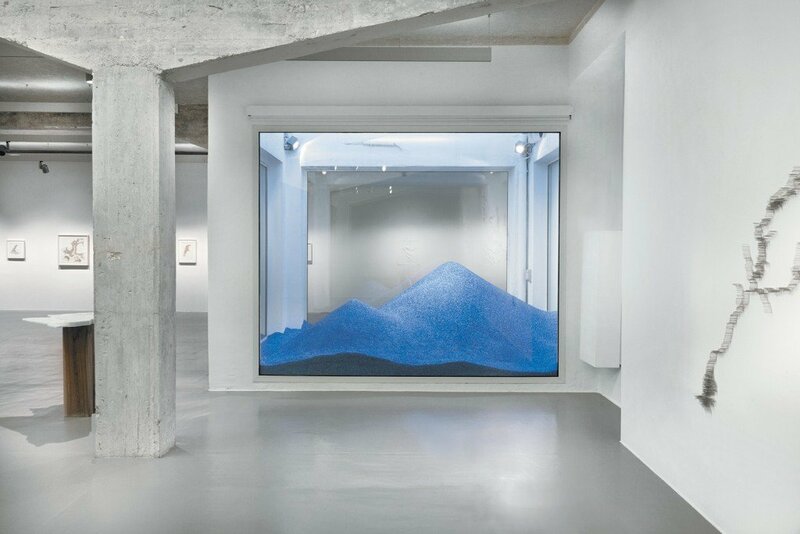 Her desire to bring the grandeur of untamed nature into a gallery setting can seem a bit too self-defeatingly well-mannered compared to equivalently scaled efforts of other Earth artists, especially Long and Heizer. In 1996 Lin married the pioneering photography dealer Daniel Wolf, whose New York gallery, which opened in 1977, was among the first in the US to specialize in nineteenth-century images. They have two daughters, and divide their time between a Manhattan apartment and a vacation house in southwest Colorado built for Wolf in 1988 by the architect Ettore Sottsass, founder of Milan’s breakaway Memphis Group. This brightly colored, busily massed caprice is antithetical to Lin’s very few residential designs, most recently her Box House of 2008 in Telluride, Colorado, a wood-clad, flat-roofed rectangle of an almost Shaker-like restraint. In 2013 the couple bought the former Yonkers City Jail, just north of New York City, and are converting that ten-thousand-square-foot facility, which abuts the Hudson River waterfront, into art studios and galleries. Last year Lin completed her largest architectural project thus far, the Novartis Institutes for Biomedical Research in Cambridge, Massachusetts, commissioned by the multinational pharmaceutical giant. Lin designed the master plan for this expansion of the firm’s enclave adjacent to the MIT campus, as well as two of the three buildings (the third is by the architect Toshiko Mori). As indicated by photos of twenty-eight study models reproduced in Maya Lin: Topologies, she settled on a format that assigned laboratories to a glass-walled medium-rise slab set at an angle against a low-rise street-front volume with ground-floor commercial spaces and offices above. The evident aim is to encourage a lively engagement with pedestrians often missing along this sometimes barren stretch of Cambridge’s biotech corridor on Massachusetts Avenue. The obliquely angled façade of the scheme’s lower portion, which reflects the irregular intersection of the surrounding streets, is clad with pale stone blocks worked into porous patterns meant to evoke microscopic sections of coral or bone. The top story is wrapped in a continuous horizontal band of glass beneath a projecting flat roof, which brings to mind midcentury modernism of a superior sort that might have been executed in Miami or Rio de Janeiro, or by Jacques Herzog and Pierre de Meuron, whose Switch House addition to their Tate Modern gallery in London, which opened in June, has a not-dissimilar exterior of perforated brick. In the new monograph, these and Lin’s other projects are illustrated with large color photographs. Regrettably, the book’s lack of a chronology and index are serious flaws. Furthermore, the strong physical (not to say psychic) responses that this environmental artist’s finest creations summon forth are beyond the mimetic capacities of even the most ingenious printed format. Lin came of professional age at the conjunction of two immense changes in architectural culture: the increasing acceptance of women in a field that had long restricted them to subsidiary roles, and a renewed sense that what during the modern period had come to be seen primarily as a technical discipline was an art form as well. Thanks to her culturally supportive upbringing, youthful acclaim, and preternatural self-confidence in following multidisciplinary pursuits without a careerist agenda, Lin has freed herself from the entrapments of the infernal fame machine. If all her experiments do not lead to a breakthrough as momentous as her defining hour in 1981, she nonetheless has established herself as a model of what architecture can become in the hands of a woman unafraid to pursue a different path.